Just 10 seconds to change out lenses. Incredibly easy! Doesn’t fog, even if you have a hot face! 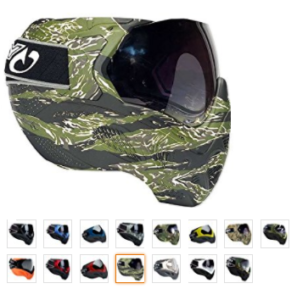 Buy the Low Profile Sly Profit LE Paintball Mask from Amazon NOW! The Sly Profit LE is a mean looking mask. While it has the same low profile styling that you see in the Dye i5 and i4 masks, it comes without the exorbitant price tag. Of course, the i4 and i5 offer UV protection and scratch protection that the Sly Profit doesn’t. Even then, the Sly is fantastically priced at just below the $80 mask. What you will love about this mask is the way you can make it comfortably sit on your head. This is the only mask out there that uses a cross over style dual strap adjustable setup at the back of the mask. It provides one of the most secure fits you can expect on a paintball field, even if you are the type of paintball player that goes physically all out on field. We really wonder how no other paintball mask uses the cross adjustable straps. Maybe Sly have a design patent that allows them exclusivity. We are not sure. But, the takeaway is that you can make this mask fit, even if you have a very large head, a very small head or just a regular sized head. Most of the people who buy the Sly Profit LE are those who want the Dye i4 or i5 mask but find those two very small for their large heads. If you looked at the cons we have listed out, it mostly has to do with the lens. The default lens that the Sly Profit LE ships out with doesn’t give you a mirrored finish, scratch protection or UV protection. They are however dual pane thermal glasses that do a fantastic job against fog. If you love the Profit but are on the fence because of the plain looking lens without a lot of features, a simple upgrade will fix the problem for you. In fact, you can pick up the Sly Profit LE for about $80, buy even a couple of lenses and have a mask that looks as cool as the Dye i4 or the i5 and still come out with a cheaper purchase price than if you bought the i4 and especially the i5. Having more than one lens is also incredibly handy when you spend many hours on the paintball field. If there is fogging in the stock lens, which can only become a problem after many hours of use, you can swap it out for a new lens in just 10 seconds, using a penny or a nickel. 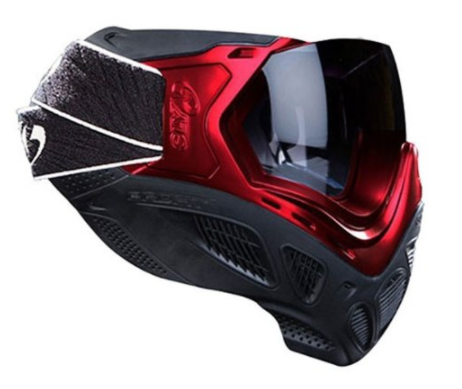 To conclude, we will say the Sly Profit LE makes for a fantastic low profile mask if you can’t quite afford or don’t want to pay premium prices for the Dye i4 or i5. Upgrade the Sly Profit with an after market lens and you have a premium product ready to compete with the big dogs. The comfort is excellent and you have excellent choice when it comes to picking styles. Buy the Sly Profit LE after choosing from more than 15 styles, at Amazon!